Hundreds of less fortunate individuals and families from the Sandy Creek/Lacona area can rest assured that on Christmas morning their children will have presents to open and there will be plenty of food for a holiday meal, thanks to the generosity and hard work of many volunteers including students from the Sandy Creek National Honor Society. Liberty Yalch wraps a present for the Sandy Creek/Lacona holiday gift and food distribution for needy families in the area. Yalch is a member of the Sandy Creek High School National Honor Society who volunteered with her fellow members to assist in the annual community service project. The NHS students, along with their adviser Casey Vallance, volunteer their time and energy each year to help local community groups wrap and box food as part of the holiday good will. Peggy Manchester, who coordinates the annual distribution, said food boxes were packed for 116 families who signed up and gifts were wrapped for more than 200 children in the area. Needy families apply for the gift and food distribution that takes place at one of the local churches just before the holiday. The application provides information so volunteers can match sizes, needs and wants to a specific child in need. The boxes are separated by child and identified with a first name and family number to allow for anonymity. Student and volunteer wrappers munched on Christmas cookies and holiday music played as they worked feverishly to get the thousands of presents wrapped. 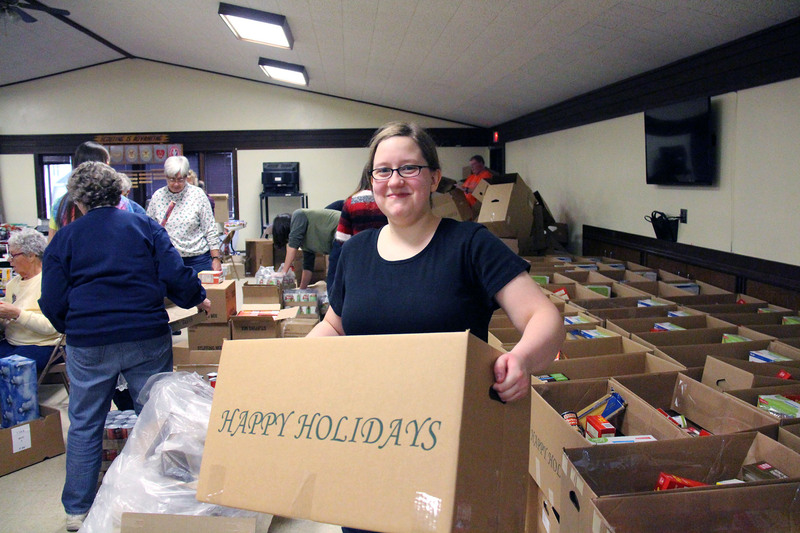 More than 100 families were recipients of a box of food for the holidays in the Sandy Creek/Lacona area through the annual food and gift distribution day. Anita Glenister carries the packed boxes into place to be ready for distribution day. 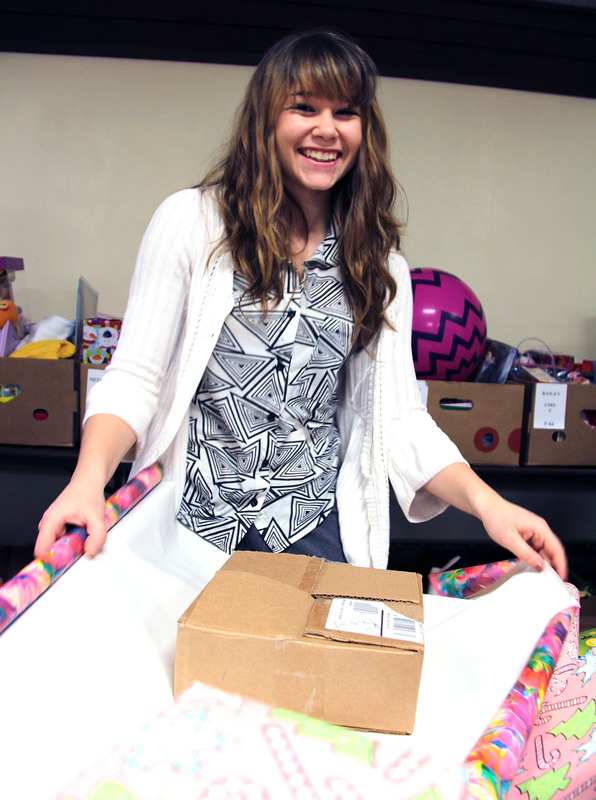 Members of the Sandy Creek High School National Honor Society volunteer each year to help package food and wrap presents as part of their service to the community. Boxes of wrapped presents piled up quickly as the students individually wrapped each present and packed each food box with the fixings for a wonderful holiday meal. On distribution day, the food boxes also included a turkey and margarine for each family. Student volunteers return again on distribution day to assist families and food pantry volunteers with transporting the packages and food boxes to the families’ vehicles for transport home. Hundreds, if not thousands of presents were wrapped in preparation for the gift and food distribution in the Sandy Creek/Lacona area for the holidays. Members of the Sandy Creek High School National Honor Society joined with other volunteers from the community to wrap presents and pack boxes for the local distribution.